Protester raises his arms as California Highway Patrol Officers stand in front of him blocking traffic on Highway 80 in Berkeley, Calif.
Denver’s police chief told officers not to intervene, but to stand by and watch, as protesters threw red paint on a memorial for fallen officers during a weekend march against police brutality. The stand-down order upset some officers, who said it sends a message that protesters can get away with increasingly brazen crimes. But at a time when some police departments have been criticized for using military-style methods of crowd control against protesters, Denver’s approach of restraint is being shared by agencies across the country, as experts say police interference can actually escalate violence and erode trust. “We have learned that providing route security at a distance and intentionally avoiding direct confrontation prevents injury to officers, limits liability, and minimizes the criminal actions of many protesters,” the chief wrote in the email to officers, adding that police should take “immediate enforcement action” only rarely. In Saturday’s case, police arrested two protesters for vandalism, but only after the demonstration. Denver Police Chief Robert White told officers the department’s policy of restraint had proven effective in earlier protests over killings by police, including Brown’s and the chokehold death of Eric Garner in New York City. Protests flared again when officers involved in both deaths were not indicted by local grand juries. That’s a departure from a time when officers would rush in and make arrests, said Chuck Wexler, executive director of the Police Executive Research Forum. “You’re not going to let them off the hook. It just isn’t necessary to wade into a crowd and create more conflict,” he said. Police chiefs in Chicago, Boston, Nashville, Tennessee, and elsewhere have taken a largely hands-off approach to demonstrations, shutting down streets for marches and opening lines of communication with protest groups. 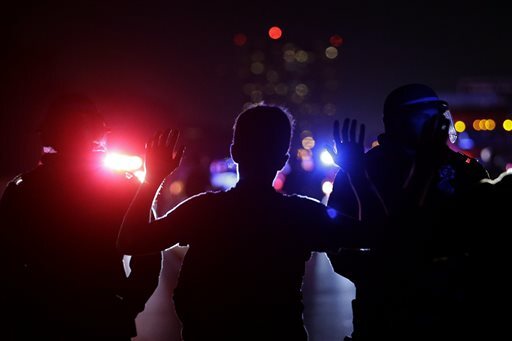 Attorney General Eric Holder urged police restraint to “minimize needless confrontation” ahead of November’s announcement that the Ferguson officer who shot Brown would not be criminally charged. Dealing with protests starts before demonstrators even hit the streets, said Maj. Max Geron of the Dallas Police Department, speaking in his capacity as a security studies scholar who wrote his master’s thesis on policing and protests. He studied the responses of the Dallas; Portland, Oregon; New York City and Oakland, California, police departments to Occupy Wall Street protests and found that a hands-off approach works best whenever possible. They could try “Serving and Protecting”, I guess. And this means serving and protecting the people, not the police themselves.